Hugh Richard Slotten. 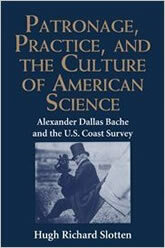 Patronage, Practice, and the Culture of American Science: Alexander Dallas Bache and the U. S. Coast Survey. Cambridge University Press, 1994. In this text, Dr Slotten explores the institutional and cultural history of science in the United States. The main focus of the book is an analysis of the activities of Alexander Dallas Bache, great grandson of Benjamin Franklin and the acknowledged ‘chief’ of the American scientific community during the second third of the nineteenth century. Bache became the most important leader of the scientific community through his control of the United States Coast Survey, which he superintended from 1843 until his death in 1867. Under Bache’s command the Coast Survey became the central scientific institution in antebellum America. Using richly detailed archival records, Slotten pursues an analysis of Bache and the Coast Survey that illuminates important themes in the history of science in the United States.